When Volkswagen admitted this week that it had purposefully cheated emissions regulations tests in the US, a global automotive scandal erupted with implications that will perhaps far exceed the car industry itself. Seemingly developing by the hour, here’s what we know so far about a scandal predictably being referred to on social media as #dieselgate. We hear "emissions" and we think CO2, but this issue isn’t about carbon dioxide. It’s about nitrous oxide only - or NOx - which is extremely harmful to humans and linked to various respiratory diseases. US regulations on NOx are much stricter than Europe’s, with harsher financial penalties, so faced with a diesel engine that couldn’t meet the standards without seriously harming performance and economy, Volkswagen acted dishonestly. German Transport Minister Alexander Dobrindt has already admitted that a similar defeat device has been used in European cars. The Audi A3, Skoda Fabia, Octavia, Roomster and Suberb models built between 2009 and 2013 are affected. SEAT is known to use the offending diesel engine too, reportedly equating to a further 500,000 cars. More details will follow. It was 2.0-litre diesel engines in question initially, but now it appears that 1.6-litre units used the same device. Volkswagen is yet to provide a full rundown, but the company's initial candour suggests it soon will. Do you own a Volkswagen Group four-cylinder diesel car? Don’t do anything yet. There’s absolutely nothing to suggest any affected car is unsafe to drive, or that the Volkswagen group is willing or able to do anything for specific customers yet. In time it will become clear what action will be taken by Volkswagen to appease customers in the UK. Hold tight until then. An independent test by the International Council on Clean Transportation (ICCT) has found that the 2.0-litre diesel engine in a BMW X3 xDrive 20d emited 11 times the permissible NOx emissions in the EU. A 2014 study by the university found big discrepancies in Volkswagen's official emissions tests and their own tests of Jetta and Passat models. They reported this to America's Environmental Protection Agency (EPA). A letter from the EPA dated 18 September 2015 informed Volkswagen that it had evidence of "defeat devices" being used in cars equipped with a particular 2.0-litre diesel engine, used to reduce nitrous oxide (NOx) emissions. On Sunday 20 September, Volkswagen CEO Martin Winterkorn publically admitted wrongdoing for the first time and apologised. He subsequently resigned. Other board member resignations have followed, and there will undoubtedly be many more. Volkswagen has been ordered to recall 500,000 cars in the US, but admits that the issue could affect 11 million worldwide. The company will shortly clarify which models they are, from which brands, and where they were sold. Information is sketchy at present, but the device is a piece of software rather than a mechanical unit. Linked to sensors, it detects the car’s speed, wheel movement, steering movement and even air pressure to determine whether a car is on a rolling road being tested. If it is, the NOx filter begins to work differently, causing performance to reduce and CO2 emissions to increase but, vitally, NOx emissions to go down. Volkswagen can be fined up to £11.8bn by the EPA in the US, based on cost per cars affected (£25,000 each), while its company value has already dropped by £8.5bn on the stock market. European sanctions will hit the company too, undoubtedly. The Volkswagen and Audi models equipped with the four-cylinder diesel engine, codenamed EA189, including the Golf, Jetta, Beetle, Passat and A3, have been withdrawn from sale in the US. It's extremely unlikely this will happen in Europe - but it's a possibility nonetheless. 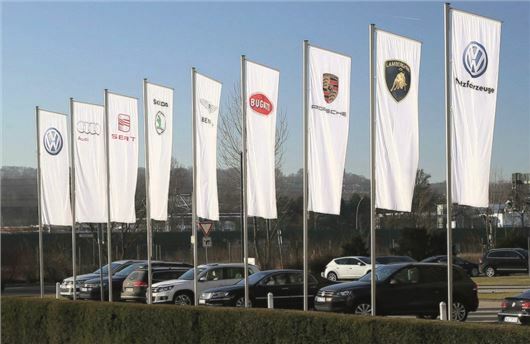 The share prices of BMW, Fiat, Daimler, Peugeot and Renault are dropping significantly – by up to nine percent so far – as suspicions of an industry-wide cheating pattern take hold. Investigators are beginning to ask questions about Mercedes-Benz cars, too. The DfT has already said it will retest affected Volkswagen cars to see if rules are being broken over here. It has also called for a full EU-wide investigation in the matter, which is inevitable. With US owners already priming lawyers for a huge civil lawsuit against Volkswagen, the same is likely to happen here. From then you can expect a flurry of calls and texts from shark solicitors explaining that "our records indicate you are a Volkswagen owner and could be entitled to thousands of pounds in compensation." In the short term, it's thought Volkswagen residual values could take a hit because consumer confidence is low. However, valuation expert CAP has already suggested there’ll be no significant impact in the longer term on Volkswagen values in the UK. It's emerging that UK ministers were sent evidence of cheating by the ICCT around a year ago, suggesting that "regulatory action is urgently required in Europe," but they failed to act. This story will develop. As an Ex VW service manager i would like to offer a few comments from a different point of view. in the first place the software was tested in germany by the KBA, but only on ONE car, with delivery miles, and they found that it was working "OK". the UK type aproval agency VCA did NOT test the software on an actual car they just compared the software with a standard mapping and agreed it should be OK.
in reality, whilst working in the dealership, at first we were allowed to revert customers cars back to the original software. VW are required by law to keep this information. there were a few complaints within the first month of starting the rollout. but as time went on the complaints grew, and VW head office withdrew the option to have the old software back. and announced that we had to deny any problems were attributed to the new software. very interesting, you mention the reduced fueling, i am no expert but it does make sense, i saw on another forum results from DYNO testing on 2 cars, one which had the original factory settings, the other had recently had the emissions fix. the torque curve after the fix was quite a lot lower than the one from the unchanged car, and this was in the lower rpm range as you say where most of the driving is done. in the last few weeks i have had the car go into limp mode, the first time the car was taken to the dealers and they reported the egr valve was to blame. this was replaced and cost me £935.38 car had done 49k miles. thought that was that until 650 miles later the same happened again. this time the dealer said EGR valve again. i told them NOT to do anything and that i wanted the one they removed 650 miles ago. i have had an idependant AUDI man take a look and the original one is OK with no defects, but badly clogged. he has removed the one that has just done 650 miles and this is the same. he has said that both valves can be cleaned and reused, cost for this is £20 but if i need to have this done every 650 miles then driving is going to get expensive. we need to find a way to force VW to do something, the general opinion seems to be have the old software back. but the dealers have told me that cannot be done. I too had the EGR valve replaced a day before reading your post here, i managed to contact the dealer and have the old part posted to me. as you rightly say it was clogged but a local mechanic has been able to clean it and it is now like new. if these EGR's ar clogging this quickly then is it not tru to say that there must be morecarbon being produced?. like frazer has mentioned in other posts??. are you getting more frequent DPF regenerations? mine does this every 150 miles without fail driving style makes no difference. my son borrowed the car for a fast rod trip to scotland last week 1090 miles in total and 9 regenerations (IN ONE DAY). sorry for the late reply this problem is so big and i get so many emails and forum messages. there seems to have been a small development at VW regarding the emissions recall for ALL diesels. i have heard on the VW grapevine that certain dealer groups have suspended the implimentation of the new software. not sure who has sanctioned this yet but i will be finding out one way or another. but the way i see it is they have admitted there is a huge problem and dont want more egg on their faces. this could help with a case to get your old software back again i just needs someone independant to start action against VW. i cannot do this because of where i used to work and what i have already said on the various motoring forums. but i can offer any information that is requested. to anyone willing to start a case. I guess that it was always going to be a tall order to remap a fuel system that was never designed to operate at the quoted emissions over a prolonged period. Suspecting the worst I delayed as far as possible the invitation to have these modifications. My 2010 blue motion Polo Had the software modification at 91976 miles in November 2016. The car was usually driven over 15 miles per journey. The fuel consumption dropped from around an average of 62 mpg to around 55 mpg ( I don’t do much town driving ) Acceleration at low speeds became a little slower. At 10270 miles, there was a noticeable loss of performance and a rattling at low speeds as Frazer reports and the engine emissions light came on, (blocked EGR valve / blocking DPF). After reading the information above and inspected the clogged EGR valve concluded there was little point in seeking a main dealer fix. As they are unwilling to re install the original software. I need reliability above anything else and feel completely let down by Volkswagen. I have now disposed of the car. I don’t think I am alone with regards to this fault. I suspect that as time goes by it will become more apparent that even after over a year to think about it VW haven’t fixed the problem, only created their own scrappage scheme. So what a surprised you’re on your own. I have little left to do other than join one of the many joint actions to try and recover my loss, or start my own.